It’s been almost four weeks since the outcry of WannaCry ransomware, but the hackers behind the self-spread ransomware threat have not been identified yet. However, two weeks ago researchers at Google, Kaspersky Lab, Intezer and Symantec linked WannaCry to ‘Lazarus Group,’ a state-sponsored hacking group believed to work for the North Korean government. Now, new research from dark web intelligence firm Flashpoint indicates the perpetrators may be Chinese, based on its own linguistic analysis. Flashpoint researchers Jon Condra and John Costello analyzed each of WannaCry's localized ransom notes, which is available in 28 languages, for content, accuracy, and style, and discovered that all the notes, except English and Chinese versions (Simplified and Traditional), had been translated via Google Translate. According to the research, Chinese and English versions of the ransomware notes were most likely written by a human. On further analysis, researchers discovered that the English ransom note contains a "glaring" grammatical error, which suggests the ransomware author may be a non-native English speaker. And since Google Translate does not work good at translating Chinese to English and English to Chinese, and often produces inaccurate results, the English version could be written for translating the ransom note into other languages. According to the Flashpoint report, the Chinese ransom notes contain "substantial content not present in any other version of the note," and they are longer than and formatted differently from the English one. 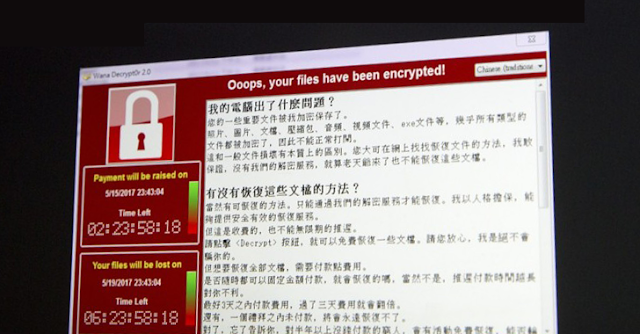 The Chinese ransom notes also use proper grammar, punctuation, syntax, and character choice – indicating that the ransomware writer is fluent in the Chinese language. "A typo in the note, bang zu (幫組) instead of bang zhu (幫助), which means ‘help,' strongly indicates the note was written using a Chinese-language input system rather than being translated from a different version," the researchers explain. "The text uses certain terms that further narrow down a geographic location. One term, libai ( 禮拜 ) for ‘week,’ is more common in southern China, Hong Kong, Taiwan, and Singapore...The other “杀毒软件” for “anti-virus” is more common in the Chinese mainland." All these clues made Flashpoint researchers into believing with high confidence that the unknown author or authors of WannaCry ransomware are fluent Chinese speaker and that the Chinese are the source of the English version of the ransom note. However, Flashpoint researchers say it's hard to speculate the nationality of the WannaCry hackers as they may be affiliated to any Asian (China, Hong Kong, Taiwan, or Singapore). WannaCry epidemic hit more than 300,000 PCs in more than 150 countries within just 72 hours, using self-spreading capabilities to infect vulnerable Windows PCs, particularly those using older versions of the operating system. While most of the affected organisations have now returned to normal, law enforcement agencies across the world are on the hunt.